Because we haven't had enough Masterpiece news. 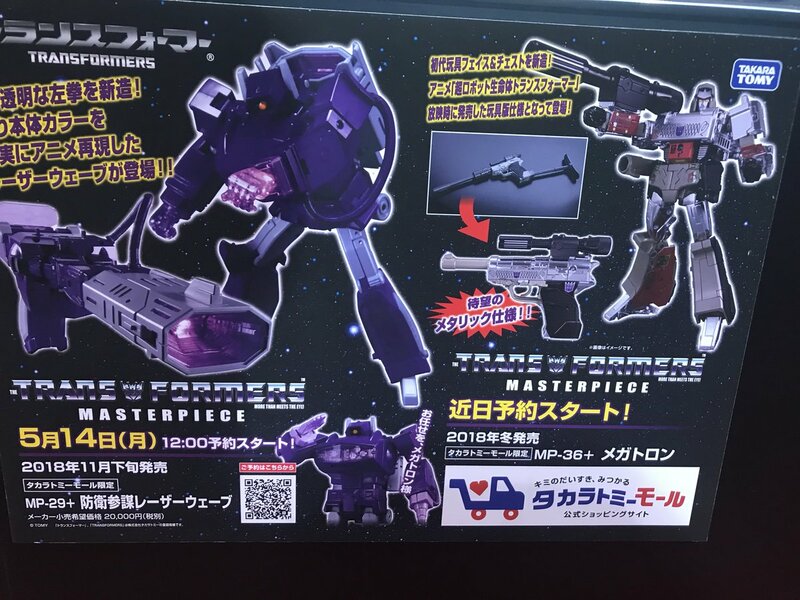 In addition to the just-revealed Masterpiece Beast Wars Megatron, Shizouka Hobby Show also has our first look at upcoming repaints of Masterpiece Shockwave (Laserwave) and Megatron! Aptly numbered MP-29+ and MP-36+ these two mimic the look of the original Generation 1 toys rather than the cartoon models. Shockwave features a much darker purple color scheme with clear pink hands and a solid pink pair, and Megatron is sporting a new head, his iconic chest decals, the ability to mount his gun barrel on his hip, and a few other toy-accurate paint details. We also got a nice set of Official Images of MP-29+ Shockawave Via Takara Tomy Mall Website. Pre-orders are up for 21600 Yen ($196) and expected for release on November 2018. That may just be the Megatron I get! Nothing wrong eith the last one, just haven’t afforded it yet. But Shockwave.. I would still prefer a dark void purple and steel leg toy edition. His toy is cold and menacing. Not feeling the look of Megatron but this Shockwave is really speaking to me. Lilacwave's days on my shelf are numbered, soon it will be back in the box! That looks like megatron is chromed except for the barrel. No opening and touching that one! Shockwave is pretty interesting. Megatron looks cool but really goofy. If you told me that was a fake I’d probably believe you. These two and the Diaclone Sunstreaker are pushing me further away from the MP line. They are clearly not for me, but I'd like something retain my interest in the MP line soon. Toy Megatron is super cool and I like it but I'm sort of leaning towards the "too expensive to buy repaints" side of things. Beast Wars Megatron on the other hand, I don't care how much it costs, I would make it happen. These both look great but I don't see myself really going for repaints on these guys and I'm not going to replace my existing versions. Good option for people wanting the toy accurate versions! I've always preferred the darker Shockwave, but not enough to buy another. Have to milk those molds some how. Just a shame minimal effort is put into them otherwise they might be appealing.